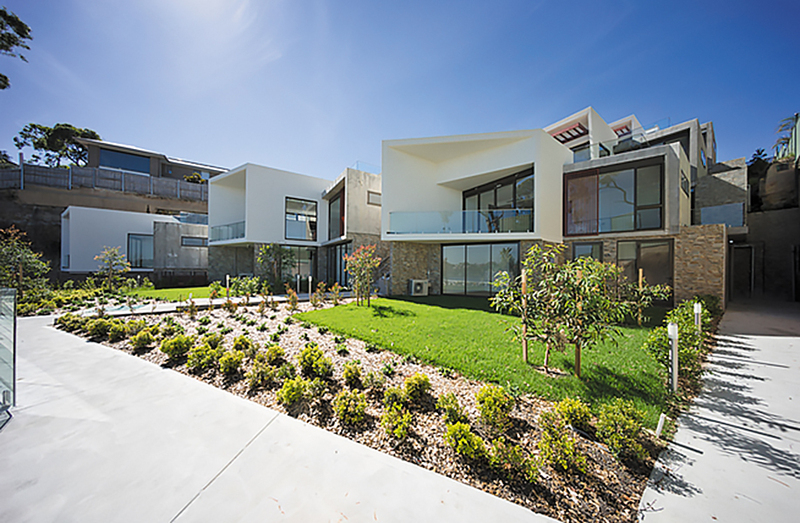 Sovereign by Tony Owen Partners consists of 23 town houses in Sylvania. 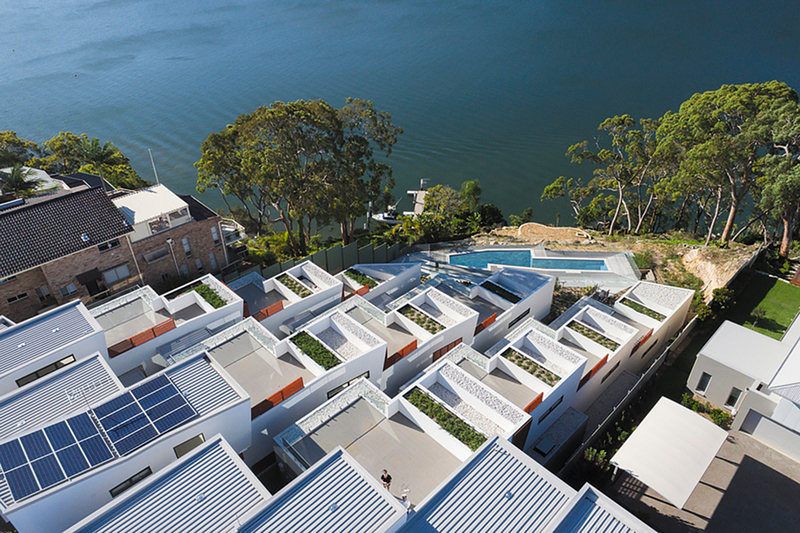 The site has direct water frontage and panoramic views on the Georges River, Sothern Sydney. Half off the site has not been developed and remains bushland. This area contains dramatic native sandstone escarpments. A feature of the design is the ‘L-shaped’ town houses which capture sun-light and provide internal private space on the limited site. These town houses are arranged in 3 rows stepping down the site. Each is accessed from a pedestrian access laneway. The upper portion of the site contains a row of town houses which conform to the levels of the topography. These town houses are arranged around the main street or town square. In its use of topography and the interaction of communal pathways and defining private space the overall result resembles a medieval hill town. The ‘L-shaped’ dwellings create central green courtyards, which create an internal outlook and maximize sun to the bedrooms. The dwellings are stacked such that living areas address a terrace on the roof of the unit in front. The village feel is reinforced by using a limited palette of materials. This consists of white painted rendered masonry with off-form timber-textured concrete. The lower portions are clad in rough stone. Timber screens are added to further create warmth. The homogeneous materials add strength to the overall composition. The landscaping design has evolved through a detailed study of the existing topography and contours. The contours are expressed in the fractal geometry of the planting.